Though they say those numbers are not out of line with past years, health officials are still urging Utahns to get vaccinated, wash their hands and avoid going to work when infected. (Jason Hoekema/The Brownsville Herald via AP) In this Friday, Sept. 16, 2016 file photo, a woman receives a flu vaccine shot at a community fair in Brownsville, Texas. More than 400 people have been hospitalized with seven reported deaths as Utah’s 2017-2018 flu season gained momentum in recent weeks. The federal Centers for Disease Control and Prevention placed Utah on its list of states having “widespread” flu activity last week, its highest level. State officials, meanwhile, are urging Utahns to get vaccinated, wash their hands and stay home from work if they are sick. “The last couple of weeks it’s really taken a sharp increase,” said Gregg Reed, a Utah Department of Health epidemiologist. 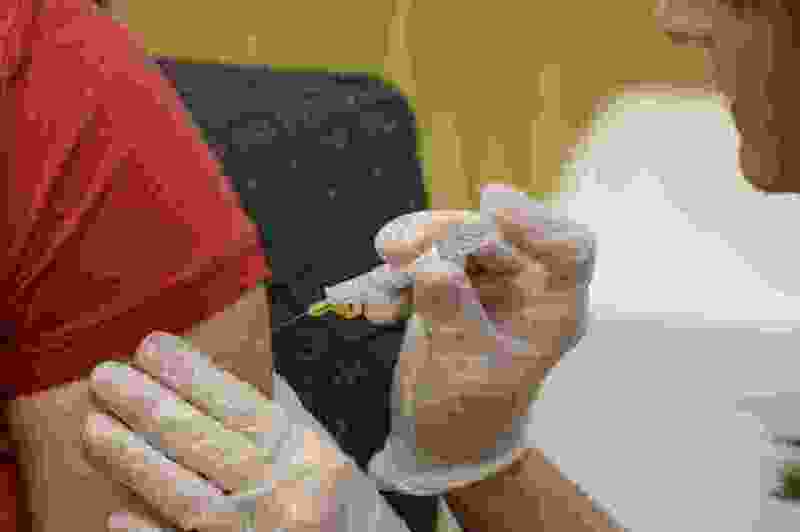 Officials, however, said hospitalizations and other measures were comparable to influenza trends over the last several years and would likely peak sometime in January. Five people have died in Salt Lake County and two people in Wayne County, officials said. At the end of last week, Salt Lake County was reporting 184 hospitalizations, with another 72 in the southwest Utah health district, which includes St. George, and 49 in Utah County. The Bear River and Davis County health districts were listed as having “high” flu activity. Flu symptoms typically include fever, cough, sore throat, headaches, fatigue and body aches. Most recover within a few days. Reed said it is still a smart idea to get a flu vaccine even though the season already is in full swing. This season’s predominant strain, H3N2, is “particularly viral,” Reed said, and and can hit older adults and children — or those with compromised immune systems — especially hard. This year’s flu vaccine is believed to be anywhere from 30 to 60 percent effective, he said. If you do get the flu, taking antiviral drugs is key to shortening the severity and duration of the illness, he added. Three people died in Salt Lake County due to flu-related issues last week, with the other two deaths coming earlier in the flu season, which generally runs from October to May. Most were at least 65 years old, according to Salt Lake County Health Department data. The two deaths in Wayne County, meanwhile, involved an elderly couple who had been visiting the area, said Sarah Bagley, a Central Utah Health Department spokeswoman. Deaths are not uncommon during flu season. In 2015, for example, nine deaths had been attributed to the virus in Salt Lake County by early January. Tens of thousands die nationally each year from the flu. Some 1,470 Utahns were hospitalized by the flu in last year’s flu season, and 1,193 in the season before that, according to state numbers. Tracking data isn’t available on annual Utah flu-related deaths.